Patented, Six Sigma Design That Is Proven To Increase Productivity.- Built To Last With A Strong, Welded-Steel Frame And A High Quality Finish. High Quality, Shock-Absorbing Wheels With Precision Bearings. 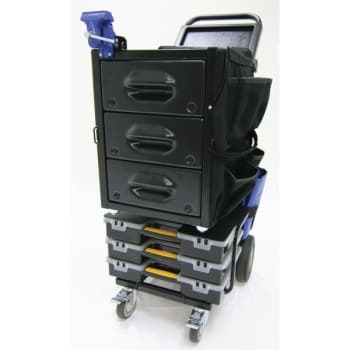 250 Lb Rated 5 Locking Casters In The Front And 400 Lb Rated, 8 Aluminum Hub Wheels In The Rear. 7 Large, 22.5 x 13.25 Drawers (Four-4, One-3 And Two-2) With 75 And 100 Lb, Replaceable Ball Bearing Slides And Built-In Parts Organizing Bins. 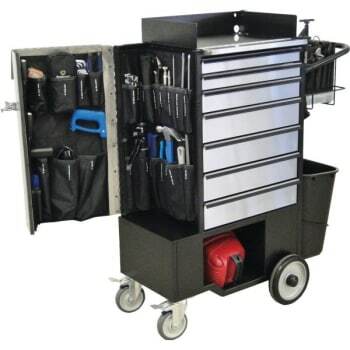 Integrated Tool Bag With Parts Box Carried In The Cart Handle. Includes Labeled Tool Pockets For Easy Tool Accountability. 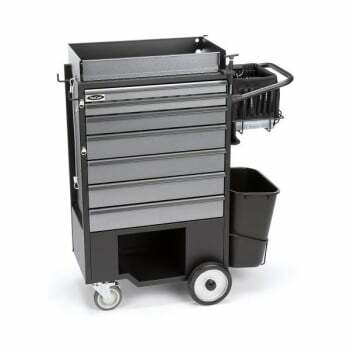 Tools Not Included. Locks Up Securely With 3 Pad Locks Provided. 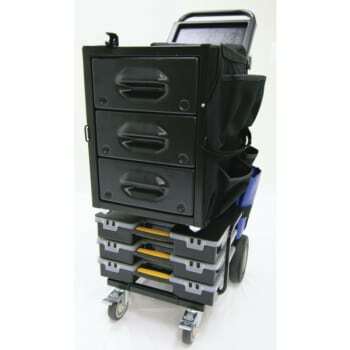 Moves QuietlyWith High Quality Wheels, Padded Drawers And Fabric Tool Holders. Large Work Surface Positioned At A Comfortable Working Height.Includes A Removable Surround And A Fold Down Side. When Folded Up A Box Is Created For Transporting Items, When Folded Down It Becomes A Work Surface. Large Built-In Trash Receptacle Great For Trash And Carrying Bulky Or Dirty Items. 2Large Lower Storage Areas. One On The Side Designed To Hold A Small Vacuum Or Other Large Items. The Other, Behind The Trash Can, Can Hold Two Gallons Of Paint Or Other Items. 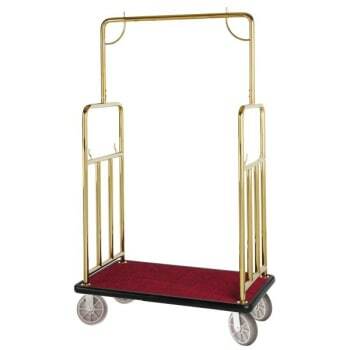 Ladder Hooks On The Front Holds Up To A 6' Standard Ladder Or A 6' To 8' Extendable Ladder. Includes Locking Cable And Lock. Large Fabric Storage Panel On The Side With 7 Large and Useful Pockets of Various Sizes. 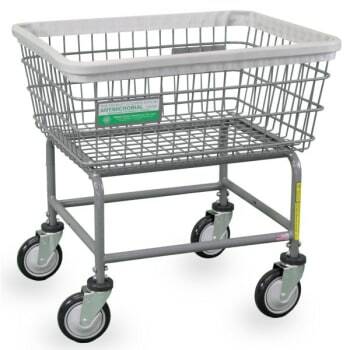 Antimicrobial Mega Capacity Wire Cart, 6 Bu. 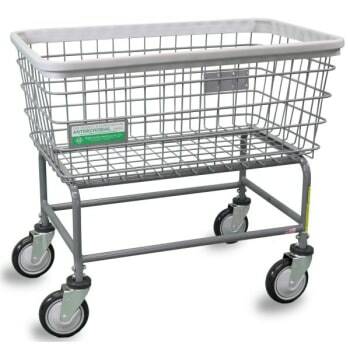 Antimicrobial Wire Cart, 2.5 Bu. 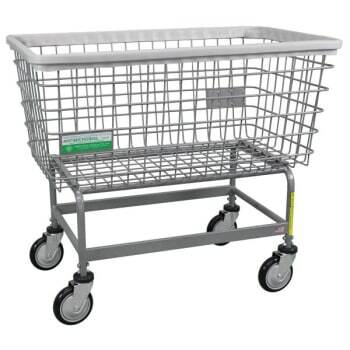 Antimicrobial Large Capacity Wire Cart, 4.5 Bu.